Fr. Richard Russell Hoynes, who served as administrator/pastor of St. Francis Xavier Chapel Japanese Catholic Center (formerly Maryknoll) in Los Angeles, passed away on Aug. 2 following an extended illness. He was 56. Hoynes was assigned to St. Francis Xavier by the L.A. Archdiocese in 2008 and brought a warmth and good humor to his duties, presiding over weddings, funerals and Masses. In 2011 he celebrated Mass at Manzanar at the former site of the Maryknoll Catholic Church. It was reportedly the first time Mass was held at the site since the camp’s closure in 1945. George Takahashi, longtime parish leader and interim parish office manager, said that Hoynes would be remembered for his smile and warm nature. “He was a constant optimist and lovingly engaged with whomever he met. He made visitors at our Masses and other services feel at home by creating a welcoming environment by explaining unfamiliar rituals in a simple understandable way,” Takahashi said. Takahashi visited Hoynes regularly at the care center where he was living, bringing him mail and messages from parishioners. “Father Richard’s sudden demise really surprised me, as my most recent visit with him found him in good spirit and cheer, enjoying his assisted-care lifestyle. He even stated to me, ‘I really like it here. I hope I will be able to stay here, since it provided almost everything I need, spiritually, socially and medically,’” Takahashi said. Hoynes was born on April 1, 1960 on Clark Air Force Base in the Philippines to Clarence and Sadae Hoynes. The oldest of four children, he found his vocation in the Catholic Church early in life, after two seminarians visited his catechism (CCD) class when he was five. Hoynes grew up in Valencia, where his family were parishioners at Our Lady of Perpetual Help. 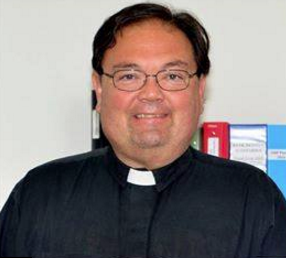 He graduated from St. John’s Seminary in Camarillo with a Masters in Divinity and was ordained in September 1988. During his 28 years in the priesthood, Hoynes served many parishes in the L.A. Archdiocese, including Saints Peter & Paul in Wilmington, Holy Trinity in San Pedro, American Martyrs in Manhattan Beach, St. Albert the Great in Compton, St. Francis Xavier and St. John of God in Los Angeles. Fluent in Japanese, Hoynes found a home at St. Francis Xavier. In 2009, under his guidance, St. Francis Xavier re-established a youth group for the parish. Chris Kokawa, a youth leader at St Francis Xavier Chapel, noted that the church hadn’t had a youth group in 20 years. “Being one of the original leaders, I have seen the Youth Group grow in the early years to the present group. Father Richard’s charisma and warm, open personality help build not only our Youth Group but also our parish to what it is today,” Kokawa said. 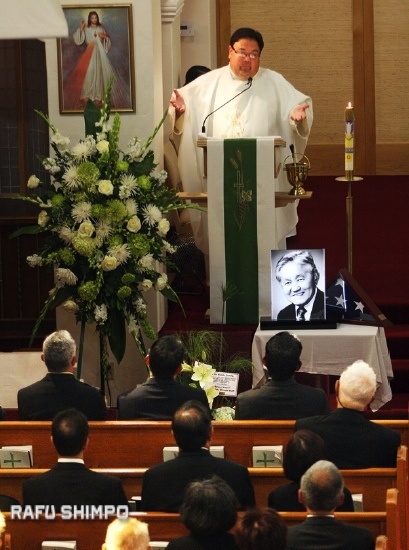 Geoffrey Yamamoto, parish council president, paid tribute to Hoynes as a big man with a big heart. “He was always happy and jolly, always gave everyone a pat on the back. He was full of love, he exuded love to everybody and everything around him,” Yamamoto said. A Funeral Mass was held for Hoynes on Aug. 23 at the Cathedral of Our Lady of the Angels. He is survived by his mother Sadae Nitta Hoynes; sister Kathy Hoynes; brothers Charles (Heather) and Michael; and a niece and four nephews. A scholarship fund has been set up in Hoynes’ name. Make sure checks are made out to St. John’s Seminary, Attn: Julia, 5012 Seminary Road, Camarillo, CA 93012, and indicate on the memo line that this is in honor of Fr. Richard Hoynes.